It must be the fact that I normally work in a shed in an asphalt carpark in an industrial estate on a freeway leading to nowhere that has led to my sudden retail rush this week. Being a casual worker, I’m shunted between branches, and this week enjoyed something of a staycation in the office in the big smoke (well, Melbourne). I was so excited to actually be in the vicinity of civilisation (at least that’s my excuse) that I bought four pairs of shoes in two days. But none of them were full price, so I spent a grand total of $120! Currently experiencing guilt as I usually only buy things that are secondhand both for financial and environmental reasons, I’m trying to convince myself that these will last longer than stuff I usually get at the op shop, although that is something only time will tell. Meanwhile I think I now have about 70 pairs of shoes, the entire collection of which probably cost less than one pair of the amazing designer footwear that enjoys luxury accommodation in Jane’s purpose-built shoe cupboard (room?) on Sea of Shoes…. Also discovered something akin to a GAP outlet… Brand Republic at South Wharf DFO, where I bought shoes for $10 and found out that GAP will be opening in Chadstone this July. While theoretically I don’t support GAP due to their sustainability/social record, I have to admit that I did buy quite a lot at their sales when I lived in Tokyo. Some of their shoes are really comfortable and they sometimes have amazing designer collaborations, some of which were still available at the outlet – but for crazy prices. I saw a shirt that was from a collaboration something like 3 years ago, and it was still $125… I don’t think it was even that much when it was just released at the GAP store in Japan!!! 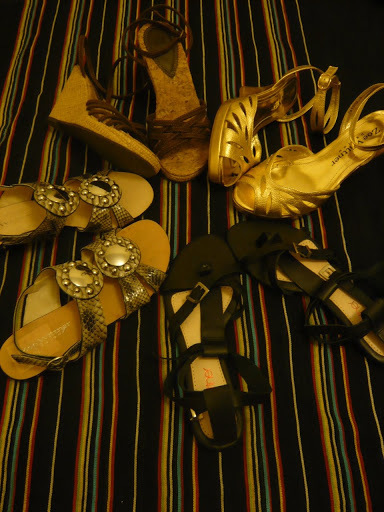 However ALL the shoes were only $10, which was just too cheap to resist.